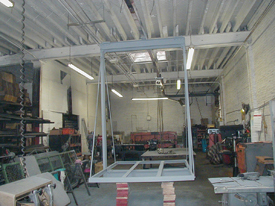 Freight elevator platforms and freight elevator slings are specially fabricated to meet each customer’s specific needs. Platforms are constructed of wood and steel, and have fireproofing on the underside of the platform. There are different load types for both freight elevator platforms and slings, such as parking garages, warehouses or fork-lift loading. Due to the special requirements of both the freight elevator platforms and slings, please contact our sales department and they will be more than happy to assist you. At TRICO value means more than just great prices. Our true value is synonymous with quality products, dedicated technical specialists and sales professionals who provide you with the information and service you need to keep your business moving. To order your freight elevator platforms or freight elevator slings , contact TRICO at (718) 349-6565, download our brochure, or e-mail us at orders@freightelevatordoors.com. Our knowledgeable employees are standing by ready to assist you with any questions you may have concerning freight elevator platforms, slings or any of our other products.